Specially designed dielectric resonators amplify and detect the characteristic molecular absorption fingerprint of materials on their surface. When incorporated into a pixelated metasurface, they can generate a distinct bar code for each molecular analyte, enabling imaging-based and chemically specific detection without the need for conventional spectrometry. A team from École Polytechnique Fédérale de Lausanne in Switzerland have developed a new nanotech sensor that converts molecular fingerprints into bar codes, which can then be analyzed and classified with advanced pattern recognition and sorting technology. Although infrared spectroscopy is generally used to detect and analyze organic compounds, this groundbreaking, imaging-based method eliminates the need for such a difficult technique with its bulky and expensive instruments. The chemical bonds in organic molecules have a particular orientation and way of vibrating, with every molecule having a set of specific energy levels usually in the mid-infrared range, and therefore absorbing light at different frequencies to produce a unique “signature”. Infrared spectroscopy works by identifying whether a molecule is present in a sample by checking if the sample absorbs light rays at the molecule's signature frequencies. However, IR spectroscopy inhibits device miniaturization and is difficult for certain applications, as well as being constrained by low sensitivities. As described in Science [Tittl et al. Science (2018) DOI: 10.1126/science.aas9768], this study developed a highly sensitive system with an engineered surface covered with hundreds of small sensors called metapixels. As a molecule touches the surface, how the molecule absorbs light changes the behavior of all the metapixels it touches. The arrangement of the metapixels is such that different vibrational frequencies are mapped to different areas on the surface, producing a pixelated map of light absorption that can then be translated into a molecular bar code. Artificial intelligence could one day help provide a whole library of molecular bar codes, offering a way to quickly identify small amounts of compounds in complex samples. While previous approaches for surface-enhanced infrared absorption sensors tend to use metallic antennas, these are constrained by the intrinsic losses of these metals. 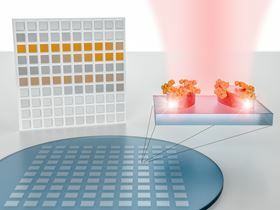 Instead, this nanophotonic sensor design based on dielectric resonators allows for the imaging-based readout of analyte absorption fingerprints. As coauthor Hatice Altug told Materials Today, “This method opens exciting new directions for detecting interactions between multiple molecular species in complex samples, especially when the absorption fingerprints of the molecular components show features with large spectral separation or low magnitude”. As the approach can function with broadband light sources and detectors, it can be miniaturized, making it suitable for practical applications such as realizing a portable medical testing device that generates bar codes for each biomarker found in a blood sample. It could also support the detection of pesticides in field-deployed water testing or the quantification of polymer compositions in materials science. Cheap wireless smartphone-integrated sensors that detect toxic gas.